Get your friends or your family and live an unforgettable experience whilst dancing/ jumping on the sea waves. It’s like trying to tame a wild horse in a Rodeo. Enjoy it! Join us on a round with the Banana in Rhodes southeast coastline! 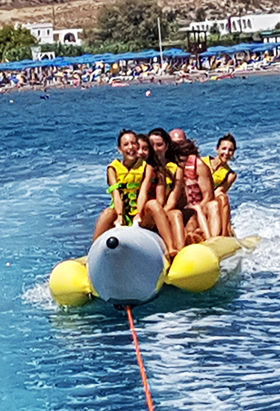 On our range of banana boat rides seating between 4 and 10 people at a time. Simply tell the Captain how fast you want to go – from a gentle scenic tour round the nature of Lardos bay to a white knuckle ride over the surf of the open sea. Swim with us in the waters of the beautiful bays of the island with a safari round. 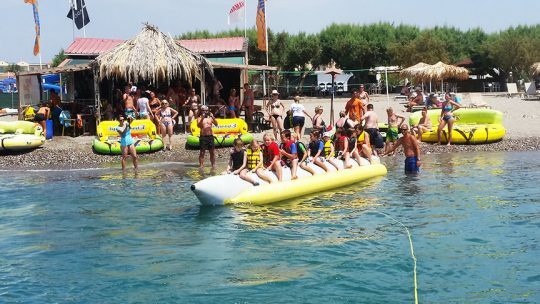 You ride the banana to the next beach and then we stop for swimming and snorkling. 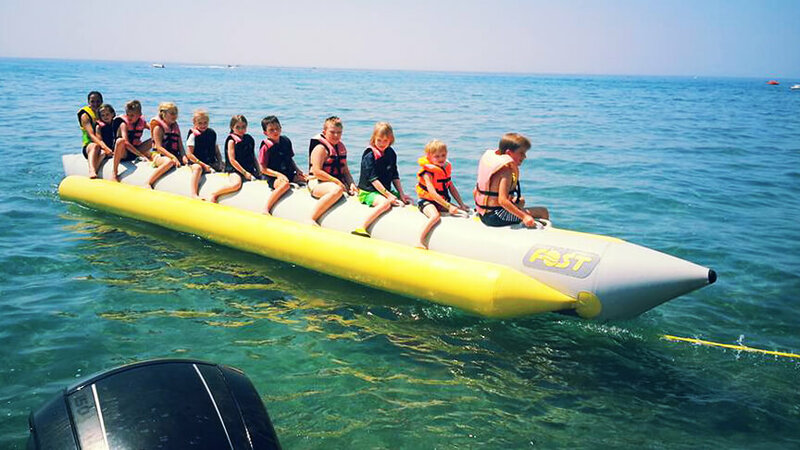 Also we offer a slow ride with the banana for our little friends, children from 3+ years old. Rent our GoPro camera and record your experience on video! With more than 25 years of experience our priority is your safety! 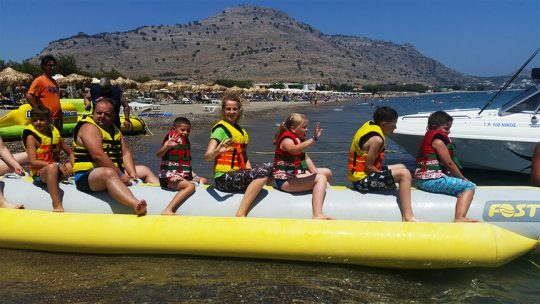 What is the minimum age to go on Banana Boat? 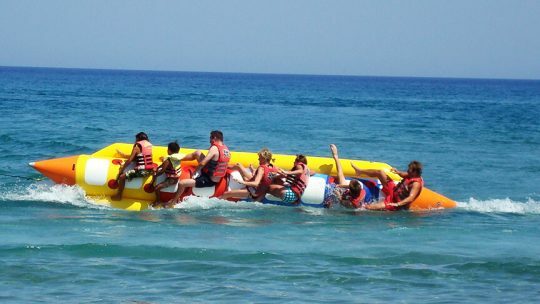 Do we need any experience to go on Banana boat? No, no experience needed at all. Just sit, hold on and enjoy the ride! Do we always fall off the Banana? No, falling off the banana is optional. Just let the driver know if you want to fall in the water or not. You can also ask him to stop somewhere and you jump off the banana for a quick swim. 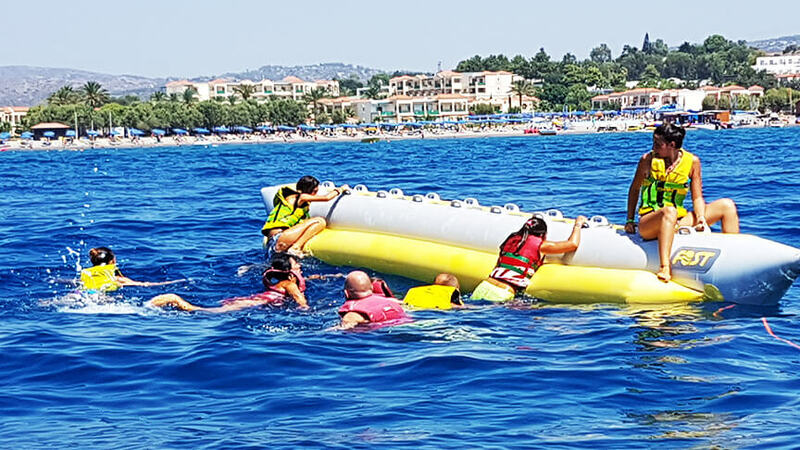 What if someone doesn't want to continue on the Banana Boat? In this case, you can make a signal to the driver to stop and either the customer gets on the boat and the ride continues, or the driver returns to the base. 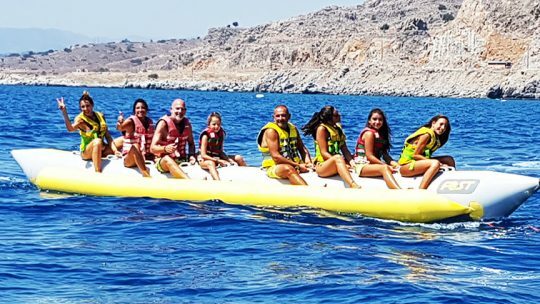 Banana boat is 100% safe for all ages. Manos and Nikos have many years of experience and they know how to give you the ride of your life. Just make sure you follow the staff's instructions and tips. We provide slow rides for our young friends or faster rides for extreme customers! Just let the driver know how hard you want it and if you want to fall in the water or not! Some people like their ride smooth, without waves and others like it wild with big waves. At Lardos beach, usually the sea is calm till 14:00-15:00 and then it get's more choppy. Read more reviews or write your own on the social media. Connect with us on social media, read more reviews, tell us about your experience and help us get better. What a brilliant time. Such an affordable day out. Nikos and family were such great hosts. Def recommend to anyone.